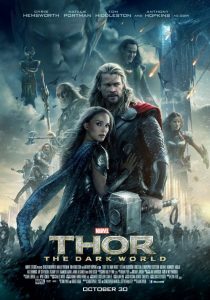 This week, “Thor: The Dark World,” the sequel to 2011’s “Thor” movie, ended up smiting the rest of the competition at the box office as expected. Box Office Mojo’s figures show an estimated $86 million take at the box office in its opening weekend stateside, on top of the money it’s already raked in overseas. Forbes mulled over how long legs it’ll have, though I expect it to dominate next weekend as well (its only competition is “The Best Man Holiday”) before the sequel to “The Hunger Games” opens the following weekend. Forbes and others note besides being, well, a Marvel film, it also did well among women (the advertising emphasizing the film’s female cast helping). There’s also the widespread popularity lately of Tom Hiddleston, the actor that plays Loki. “Free Birds” actually moved up a spot from fourth place to third, as it made $11 million this weekend, a 29% drop. With $30 million so far, it still has a few weeks to go to at least break even domestically before “Frozen” comes out. Again, I assume its foreign take is an iffy proposition, given its extremely US-centric nature; they can rename the film’s holiday all they want for overseas, but it still has Native Americans and Pilgrims in it. Meanwhile, last week’s big film “Ender’s Game” ended up tumbling 62% to take fifth place, earning $10 million. With only $44 million domestic box office so far, it’s fair to say the film’s a flop. “Ender’s” only hope now is to do well overseas. “Cloudy With a Chance of Meatballs 2” is in tenth place with $2.8 million, for a total take to date of $110 million. I expect it’ll finally fall out of the top 10 next weekend.